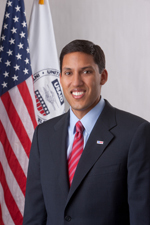 Dr. Rajiv Shah, Administrator for USAID, delivered keynote remarks in October at USAID's "Embracing Enlightened Capitalism" forum in Washington, DC. The event was co-hosted by the newly formed Office for Innovation and Development Alliances, created to elevate the role of partnerships - particularly Public-Private Partnerships - at USAID and to streamline the way partnerships are formed across the organization. Click here to read a full transcript of the speech. Dr. Shah's speech focused on a strong and dynamic private sector as one of the core ingredients for global poverty alleviation. "We must partner with the private sector much more deeply from the start, instead of treating companies as just another funding source for our development work," he said. "Despite strong private sector investment in several low-income countries, it is not occurring everywhere, and even where it is occurring, private investment is nowhere near its potential," he continued. "And while we have been engaged in this work for years, the development community does not always embrace the encouragement of private sector activity as part of our core mission. That must change." Dr. Shah cited a number of groundbreaking, successful partnerships, noting that since the creation of the Global Development Alliance a decade ago, 1,000 partnerships have been formed with over 3,000 private sector players like Microsoft, General Mills, Pepsi, and Coca Cola. "Our Center programs often serve as a bridge between the public and private sectors," commented David Greeley, FHI 360's Vice President for the Center for Private Sector Health Initiatives (CPSHI), who attended the forum. "We act as a catalyst, helping to identify and bring to bear the strengths of each of the sectors to address health issues in the developing world. To echo Dr. Shah's sentiments, lasting improvements in health and development cannot be achieved without true, open, and sustainable partnerships." Dr. Shah's presentation also outlined a series of upcoming policy guidelines for future USAID investments, namely focusing on core economic growth assistance in countries that demonstrate real commitment to private sector led growth; accelerating a shift from a model that provides technical assistance to governments through foreign consultants to one that employs local expertise; and working more effectively with partner governments to gain a better understanding of the political costs and obstacles to reform, turning to local political experts who understand governments best.